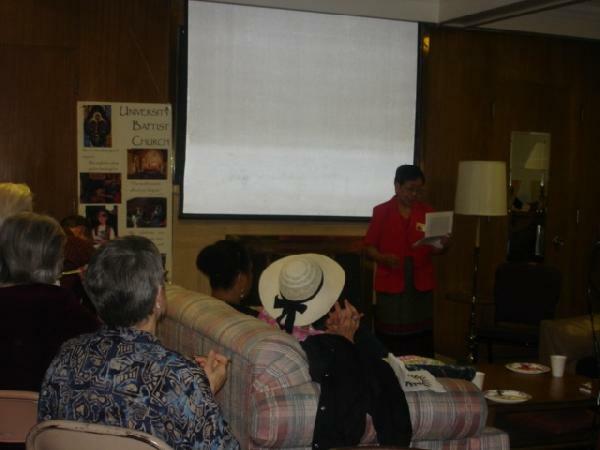 guest speaker, Sister Florchita Bautista discussed her reflections at the University Baptist Church before an audience of fifty people last Sunday, August 5. Bautista cited the cases of human rights violations in the Philippines, specifically, stories of the grade three pupil Grecil who was shot by military men and was even accused of being a member of the rebel group New People�s Army, and that of Alice, the wife of Dr. Chandu Claver whose family is in Canada now seeking political asylum. Alice got eight bullets from the military operatives in Kalinga, northern part of the Philippines. Like many activists, Alice before her death was very active with progressive organizations that are fighting for the rights of the indigenous people over their ancestral lands and was critical of the corrupt policies of the government. 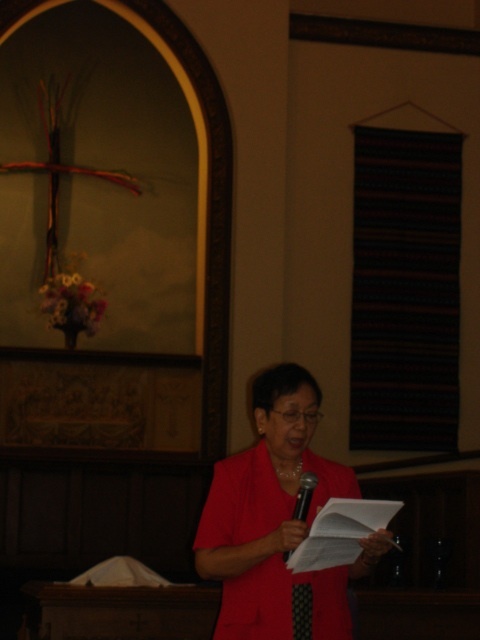 So says the Sunday Scriptural reading from which the guest speaker, Sister Florchita Bautista discussed her reflections at the University Baptist Church before an audience of fifty people last Sunday, August 5. Bautista cited the cases of human rights violations in the Philippines, specifically, stories of the grade three pupil Grecil who was shot by military men and was even accused of being a member of the rebel group New People�s Army, and that of Alice, the wife of Dr. Chandu Claver whose family is in Canada now seeking political asylum. Alice got eight bullets from the military operatives in Kalinga, northern part of the Philippines. Like many activists, Alice before her death was very active with progressive organizations that are fighting for the rights of the indigenous people over their ancestral lands and was critical of the corrupt policies of the government. She discussed the abuses suffered by the Filipina domestic helpers under the hands of their Canadian employers. The Canadian government promotes the Live-in Caregiver Program (LCP), much like a �guest worker program that some leaders in the US government are supporting. Several immigrant communities in the US are currently terrified due to the raids, detentions and deportations being conducted by the Immigration and Custom Enforcement (ICE). Local progressive organizations, the Church Council and other peace groups in Seattle will hold a press conference on Aug. 14 demanding among other things a moratorium on such raids. Like many activists, Alice before her death was very active with progressive organizations that are fighting for the rights of the indigenous people over their ancestral lands and was critical of the corrupt policies of the US-A rroyo government.